Yesterday 25,000 runners braved rain, wind and cold 40 degree temperatures to run in the MetroPCS Dallas White Rock Marathon. You didn't have to run 26.2 miles. They also had a half marathon and a 5 person relay. The company I work for sponsored a relay team that Brian and I were able to be a part of. Brian started the race, leg 1 was 5 miles. I ran leg 3, the longest leg. Its listed on the course map as a 6.5 mile run, but its really just over 7 miles. 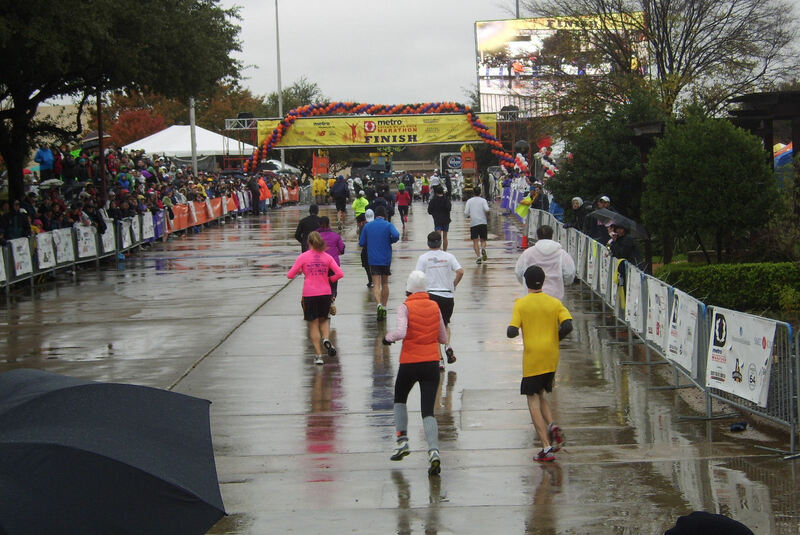 By the time each runner was finished they were soaked from head to toe. As a team we completed the marathon in 4:39:29. Maybe next year I will try to run the half. Its 6AM and still raining. Terrell has received just over 2 1/4" of rain since Saturday morning. We need every bit of it. Once I got back to the finish line I went out and watched runners as they approached the finish line. Just looking at this picture gives me chills again. LSU vs Alabama in the BCS Championship game. I would rather see OK State in the game, but it doesn't matter. LSU would win against any team its put up against. I like the Fiesta and Rose Bowl match-ups, but the Orange and Sugar do nothing for me. I like all three area bowl game match-ups. Cotton Bowl-Kansas State vs. Arkansas, these teams were a combined 20-4, losing to OK, OK State, LSU and Alabama. TicketCity Bowl-Penn State vs. Houston. Organizers of this 2nd year game must be thrilled to get these two teams. The last area bowl game is the Bell Helicopter Armed Forces Bowl-BYU vs. Tulsa. Both teams like to score. Teams that finish with only 6 wins should not be eligible to go to a bowl game. The organizers of the Kraft Fight Hunger bowl must be thrilled with their game. They will pit 6-6 Illinois, who lost their last 6 games against 6-7 UCLA. The teams were so excited they both fired their coaches in the last few weeks.